The heroic pilot who calmly landed a Southwest Airlines flight after a midair explosion caused a woman to be nearly sucked out of the aircraft, leaving one dead, has been identified. 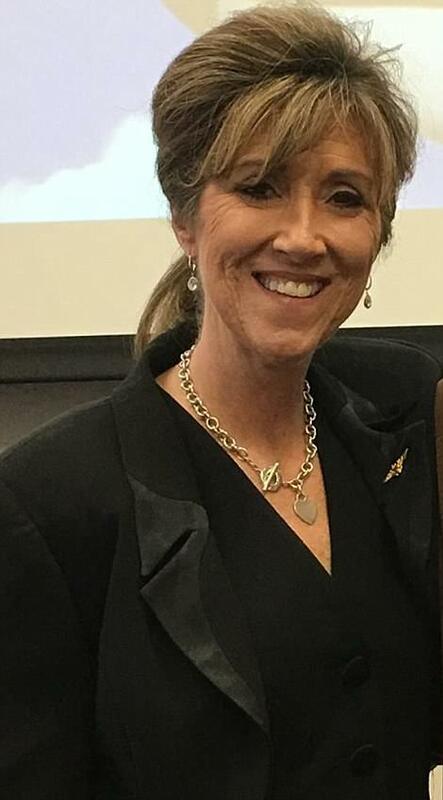 Tammie Jo Shults, a former Navy fighter pilot and one of the first women to fly an F-18, quickly brought the Dallas-bound Southwest Flight 1380 to land at Philadelphia International at 11.30am after the explosion at 32,000ft. National Transport Safety Bureau Chairman Robert Sumwalt confirmed on Tuesday morning that one person died on the flight. 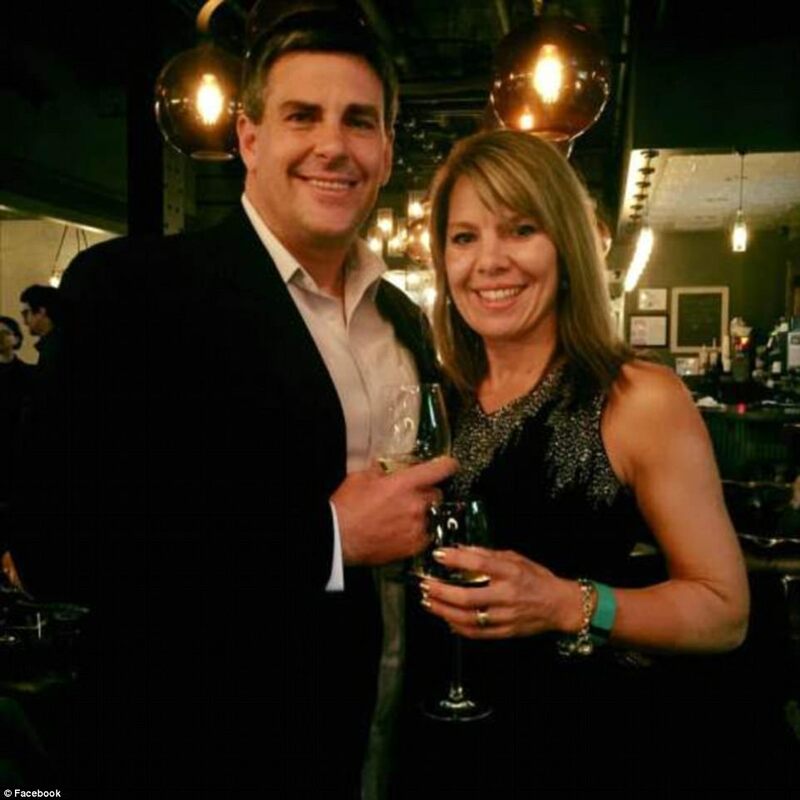 She has since been identified as Jennifer Riordan, a mother-of-two from Albuquerque, who was killed after she was nearly drawn out of the window when it smashed in a midair explosion, and had to be pulled back into her seat by other passengers. Tammie Jo Shults (pictured left, and right on the aircraft with the rest of the crew), a former Navy fighter pilot and the first woman to fly an F-18, quickly brought the Dallas-bound Southwest Flight 1380 to land at Philadelphia International at 11.30am after the explosion at 32,000ft. Asked if the plane was on fire, she said: 'No, it's not on fire but part of it's missing. They said there is a hole and someone went out.' She added that 'we have injured passengers' as she requested medical staff to meet them on landing. Passengers say that after landing the plane, the pilot took the time to speak to all those aboard personally. Schults was one of the first female fighter pilots in the US Navy and first to fly an F-18. She later became an instructor, as the Navy did not allow women to fly in combat, and she finally resigned in 1993 when she joined Southwest Airlines. A mother-of-two, originally from New Mexico, Schults now lives with her husband Dean, a fellow pilot, in Fair Oaks Ranch, Texas. 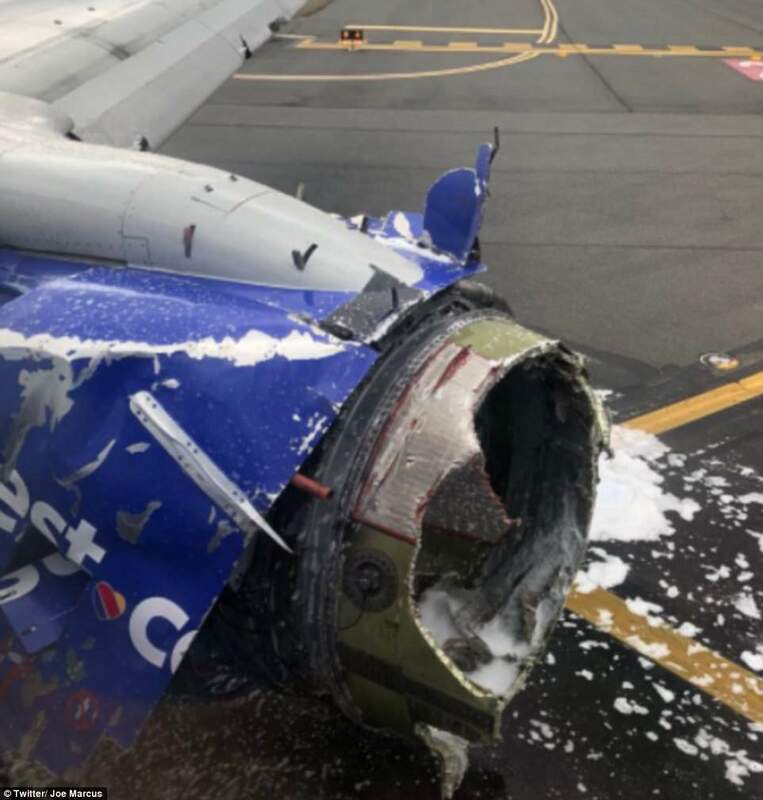 The Boeing 737-700, which took off from New York's La Guardia Airport for Dallas was traveling at 32,500ft when the engine on the left side of the plane exploded. Passengers said they heard a loud 'boom' and the plane immediately dropped, they said, by what felt like 100ft. Riordan was sitting next to the smashed window was drawn towards it and others next to her held her down for 12 minutes until the plane landed. Before the NTSB's announcement that there was one fatality involved, the Philadelphia Fire Commissioner said she was taken to hospital in a critical condition. 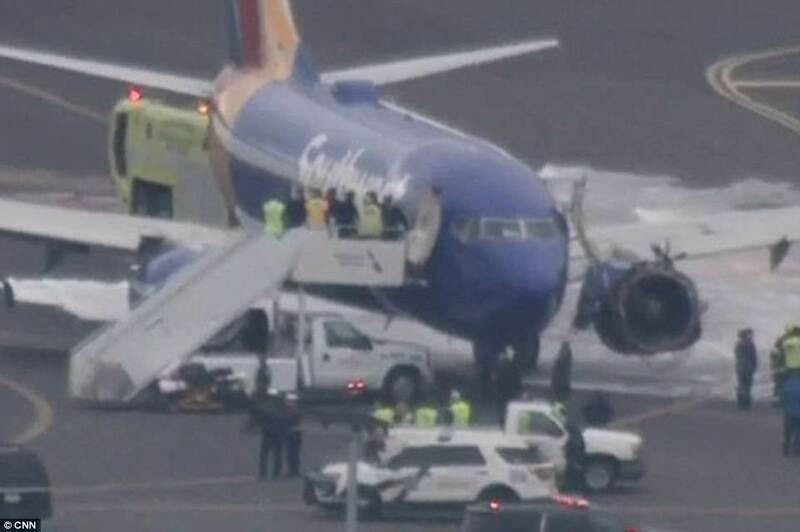 'One passenger, a woman, was partially drawn out towards the out of the plane, she was pulled back in by other passengers,' Todd Bauer, the father of another passenger on board, told NBC 10. Terrified passengers shared videos and photos from on board before the plane landed as they descended at 3,000ft per minute until they leveled out at 10,000ft. 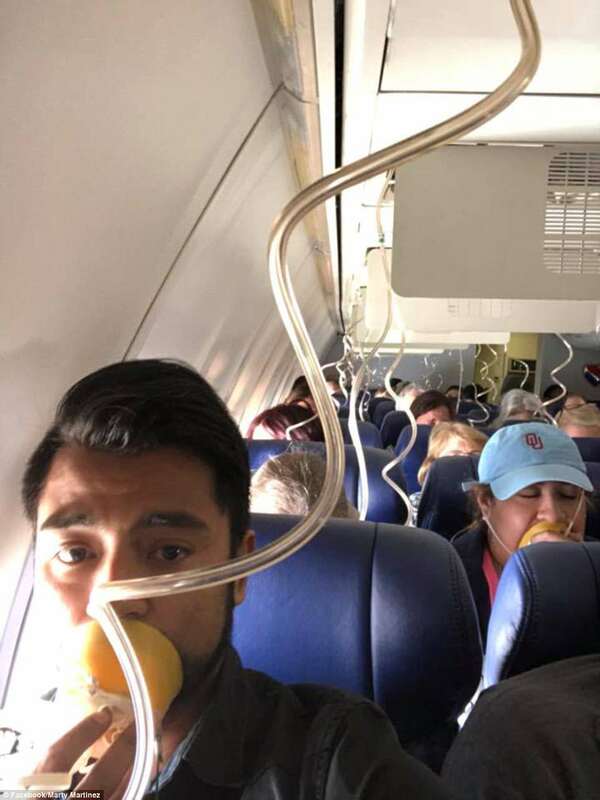 One passenger filmed himself as he fitted his oxygen mask. 'Something is wrong with our plane! It appears we are going down! 'Emergency landing!! Southwest flight from NYC to Dallas!!' Marty Martinez said as he broadcast live from the plane on Facebook. He paid $8 to connect to WiFi as the plane was going down, he said, in order to say his goodbyes. He is the passenger who later told CBS the woman's injuries left 'blood everywhere.' There were confused reports from other passengers that someone on board suffered a heart attack. We are deeply saddened to confirm that there is one fatality resulting from this accident. 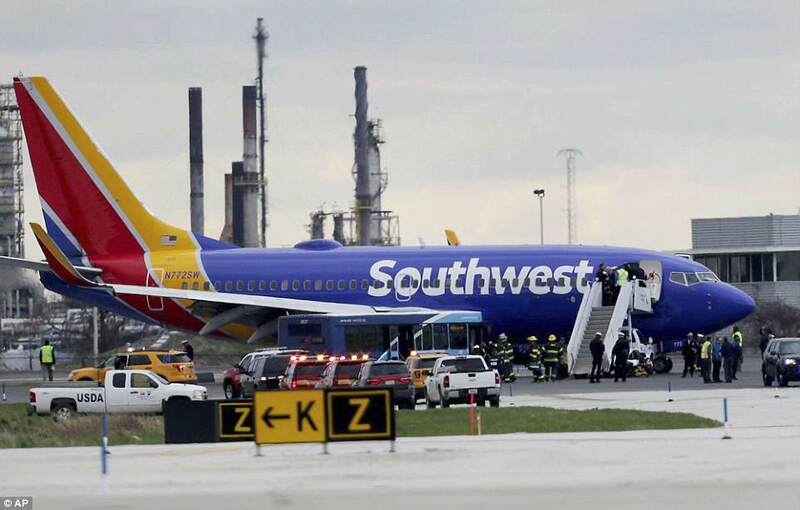 The entire Southwest Airlines Family is devastated and extends its deepest, heartfelt sympathy to the Customers, Employees, Family Members, and loved ones affected by this tragic event. We have activated our emergency response team and are deploying every resource to support those affected by this tragedy. Martinez added that the plane 'smelled like ash' once the window was open. He said flight attendants rushed over in shock and pleaded with passengers to cover up the hole. The first sign of trouble was a loud noise which happened when the engine exploded. Timothy Bourman, 37, was sitting at the back of the plane when he said he heard a loud 'boom'. 'All the sudden, it felt like we dropped 100 feet. Everybody knew something's going on. 'This is bad, like really bad.' A lot of people started panicking and yelling, just real scared. 'We were kind of out of control for a while. 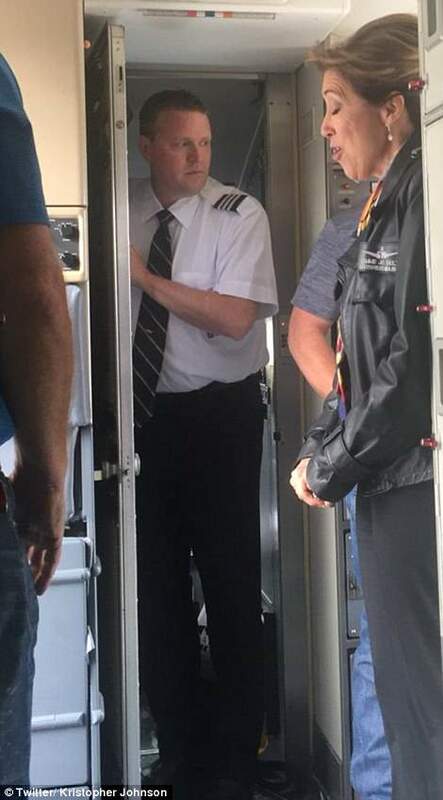 It seemed like the pilot was having a hard time controlling the plane. Honestly I think we just all thought we were going down,' he told Philly.com. Bourman, who was traveling with his wife, said they thought they were about to die until the pilot managed to gain control of the aircraft. 'We're just all really thankful to be alive right now. Thankful to God, thankful to that pilot,' he added. Matt Tranchin was sitting three rows behind the window that smashed. He described the chaos and said even the flight attendants were crying in fear. 'Flight attendants rushed up. There was momentary chaos. Everyone kind of descended on where this hole was. As passengers we weren't sure if they were trying to cover up the hole, but the plane smelled like smoke. 'There was ash coming through the ventilation system. We started dropping,' he told ABC News. 'As kind of an indication of how terrifying it was, some of the crew couldn't hold back their horror. 'And some were crying as they looked out through the open window onto the engine,' he added. 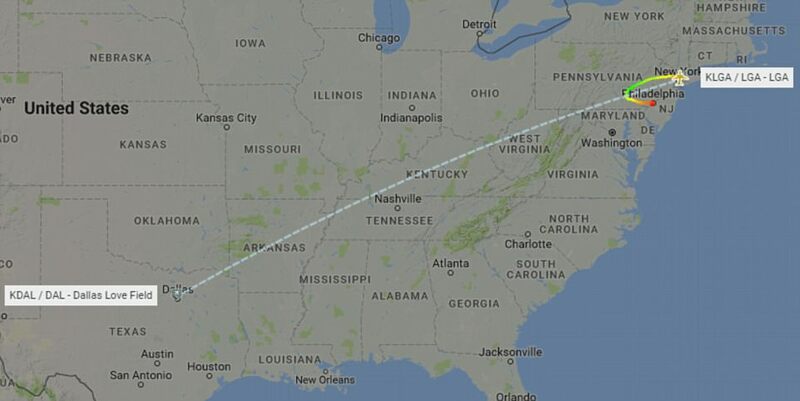 As the plane made its descent towards Philadelphia, the crew warned passengers to brace for impact. 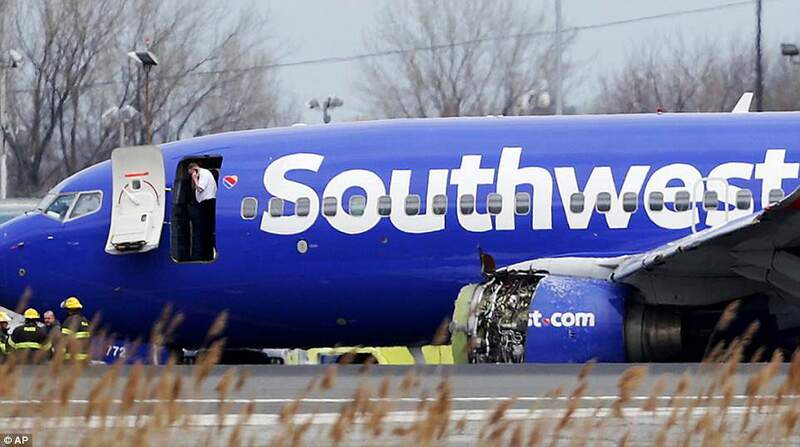 Southwest Airlines has not acknowledged the woman's injuries. 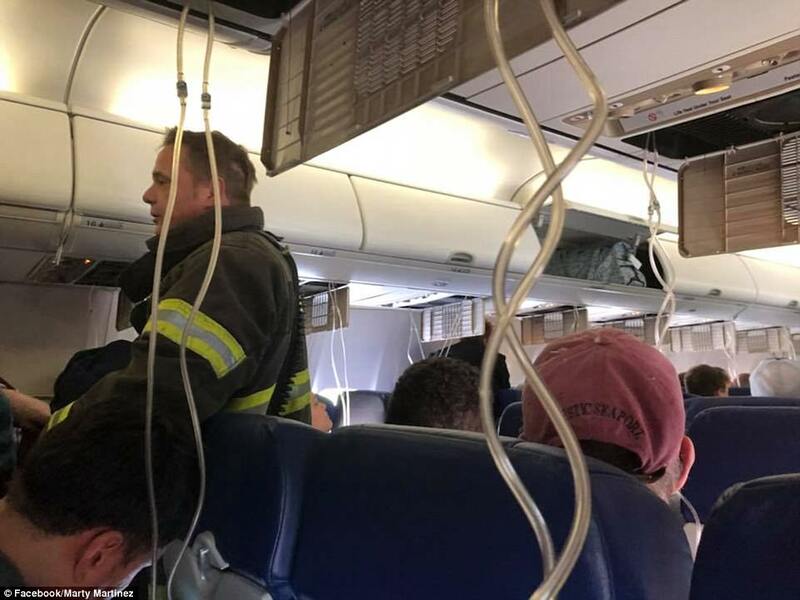 In a statement it put out on Twitter, the airline said: 'Southwest Airlines flight 1380, which departed LaGuardia for Dallas Love Field , diverted to PHL because of an operational event. It has given no further comment on the injured woman or what caused the engine to explode. 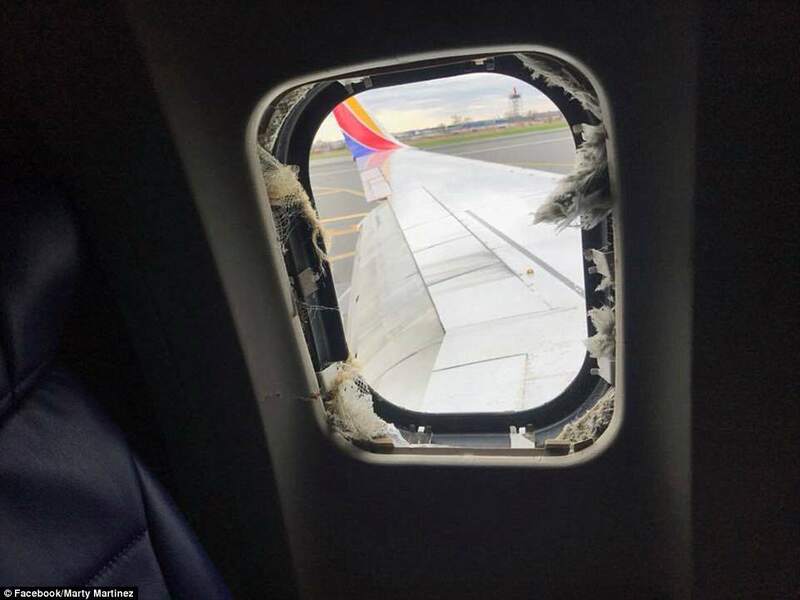 When the shrapnel pierced the window, it depressurized the cabin and triggered the oxygen masks. Despite the chaos in the air, others said the emergency landing was fairly calm and smooth. One passenger told CNN: 'It was a stable landing. We started descending, made the turn back to Philadelphia. 'We were with one engine for maybe 10 minutes. Passengers were taken from buses to the airport. 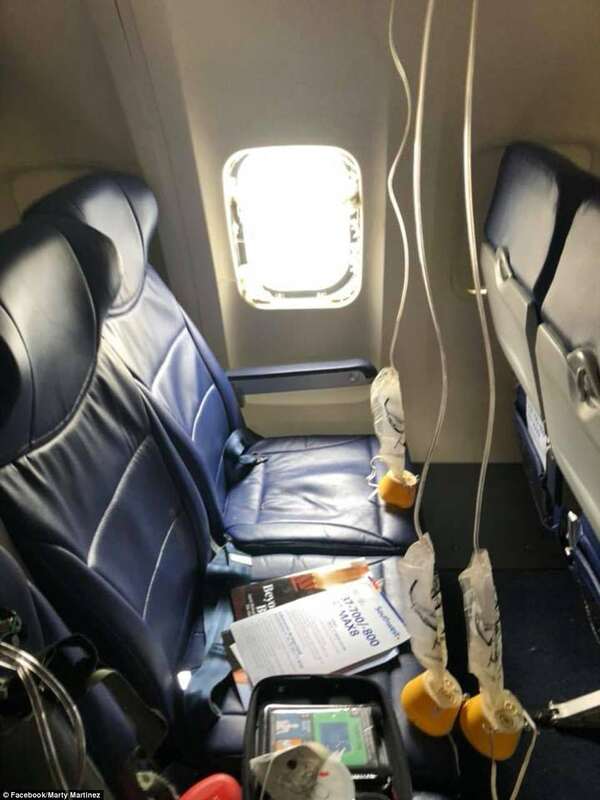 It is not the first time the malfunction has occurred on a Southwest-operated Boeing 737-700. In August last year, a different flight from New Orleans to Orlando was forced to make an emergency landing at Pensacola Airport in Florida after the casing surrounding one of its engines tore away at a similar altitude. On Tuesday, the airline manufacturer said it was aware of the accident and was prepared to cooperate with investigations. 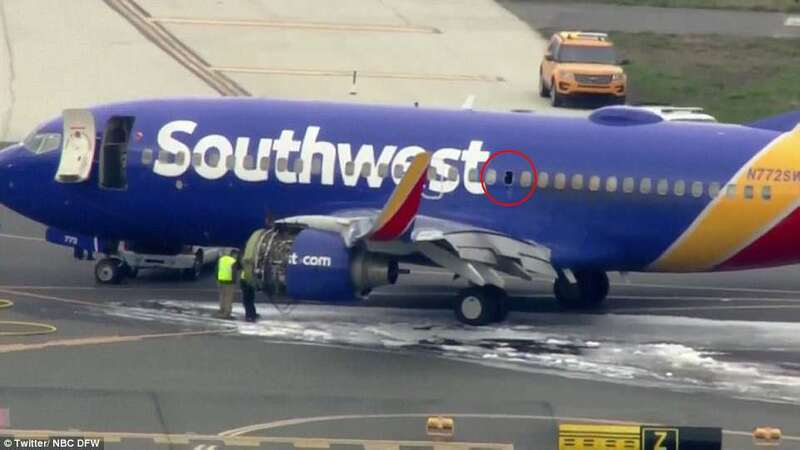 'Boeing is aware of an incident with Southwest Airlines flight #1380. 'We are gathering more information and stand ready to provide technical assistance,' it tweeted. 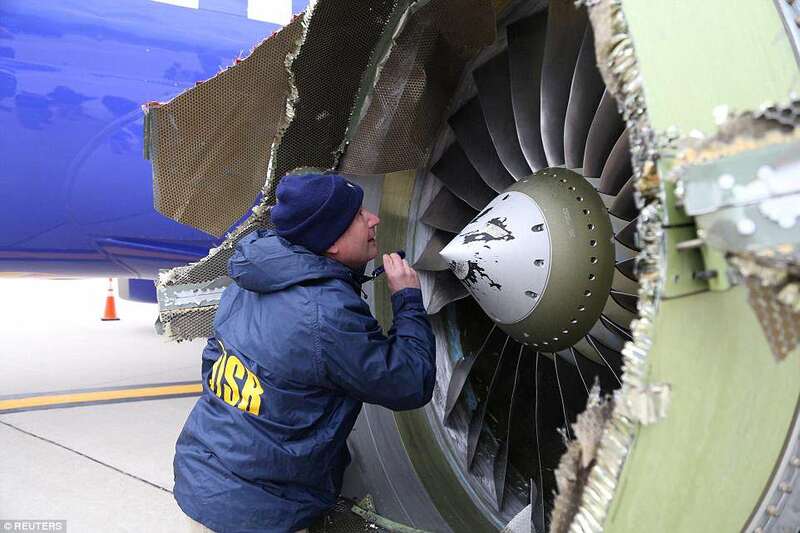 The engine which exploded is a CFM56 turbofan engine which costs $10million and has a fan diameter of 68 inches. The engines are the most popullar engines on single aisle commercial planes and are used by all of Airbus A320 aircraft. We're told there was blood everywhere yet the photo that shows the window where the apparently deceased banking woman got fatally injured shows no sign of blood. I'm calling hoax. As well, first sign of hoax occurred on TV yesterday with press conference by NTSB guy who said the engine didn't really explode, by his definition-- and he kept smiling-- known as "duping delight". The passengers sent the pilot a message! It will be awhile before Allec Joshua Ibay can get all of the details on this accident to make a video for his You Tube channel. But if you are an aviation buff and want the complete picture of what happened in past airline accidents, he's the channel to go to. Always fascinating, sometimes heroic, sometimes idiotic. 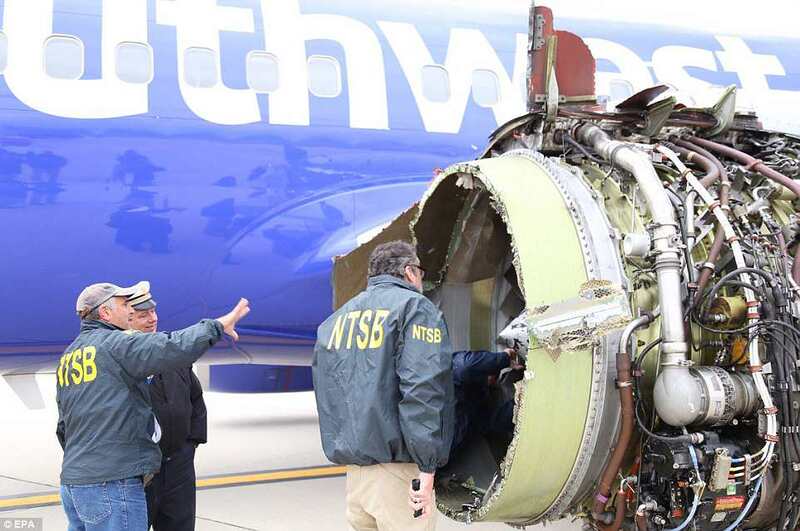 This Southwest Airlines accident was something every multi-engine pilot trains for intensively and Captain Shults did everything right. The steep dive she did to get the aircraft down from 32,000 feet to 10,000 feet was standard procedure to return to a breathable altitude. It would have been nice to announce to the passengers that the dive was intentional and they were not going to crash, but I understand if she was a bit preoccupied at that moment.